Posted on 2019/04/06, 02:07, by aj, under poli-mics. The only one of those recommendations the Rudd/Gillard govt’s managed to implement was the increase in the tax free threshold from $6000 to $18,200, accompanied by compensating marginal rate increases from 15% to 19% and 30% to 32.5%. Most of that’s from last year’s budget, which looks like it passed despite opposition from the ALP, the Greens and independents Tim Storer, Andrew Wilkie and Cathy McGowan. This year’s budget just changes the 19% bracket’s cutoff from $41,000 to $45,000, increases the LITO, and drops the 32.5% bracket to 30%. 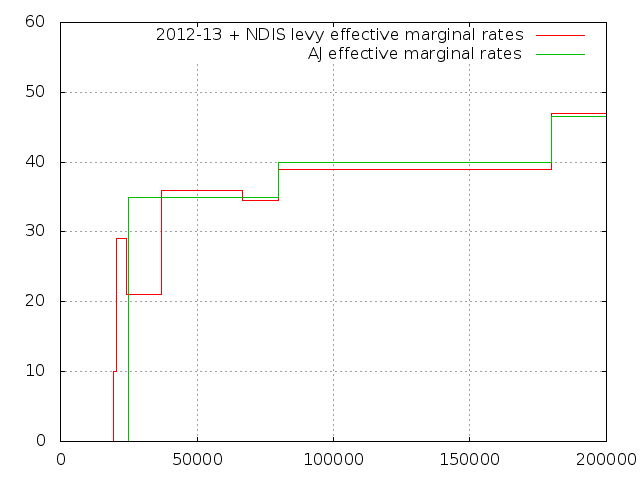 That’s still a bit worse than the Henry review’s recommendations from almost a decade ago: the 19% marginal rate should and the low-income tax offset should both be dropped, with the tax free threshold raised to compensate for both of those, and the medicare levy should be rolled into remaining rates, increasing them to 32% and 47%. But still, it’ll be the first reduction in the number of tax brackets since 1990, which isn’t nothing. The budget papers have an interesting justification for the changes: they keep the percentage of govt revenue collected from the top 1%, 5%, 10% and 20% of taxpayers roughly stable (in percentage of total terms). Without the changes, I think the numbers indicate that the top 1% of taxpayers and the bottom half of the top 20% of taxpayers currently pay around 16.7% and 16% of the government’s income tax revenue, but without the changes that would reverse to 15.6% and 16.1%, while with them it’s 17% and 15.5%, which seems fairer. 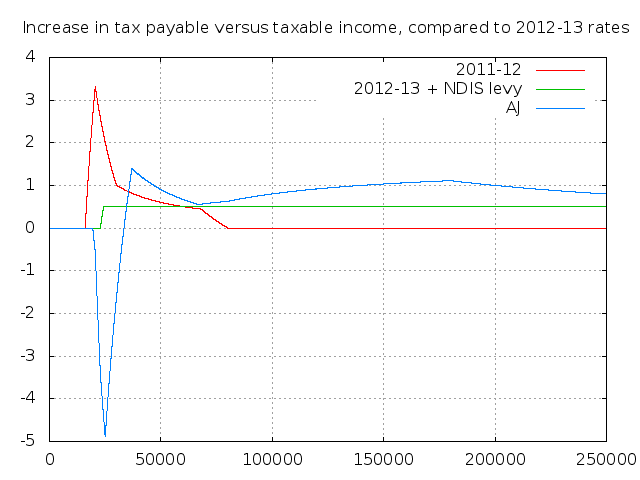 On the other hand, in both cases the burden on the bottom 80% of taxpayers is slightly increased in both cases. Not really sure what good answers here are — it really depends on how much more the top x% earn compared to the top y%, and that’s easier to look at just by looking at average and marginal rates anyway — but it seems like an interesting thing to think about. would be very close to the post-2024 plan, if anyone could manage the politics of not special casing the medicare levy or the low-income offset. In the same post, I also thought about an unconditional $350 per fortnight payment as an optional alternative to the tax free threshold — so you get $350 a fortnight (tax free) direct into your bank account, but pay 35% from the first dollar you earn other than that all the way to $80k. That seemed like a fairly plausible way to start on a UBI to me — if you’re earning more than $25k per year, it doesn’t affect your total tax bill at all, but it’s a quarter of the minimum wage or about half the newstart allowance, so it’s not trivial, and doesn’t require any additional paperwork or convincing centrelink you’re not a bludger. If you could afford to raise the tax free threshold to $30,000 and just have a 32% rate from there to $200,000 (which would mean everyone earning over $45,000 pays the same tax, while everyone earning less than that pays less tax), you could have a UBI of up to $370/fortnight, without any impact on anyone earning more than $30,000 a year, or any disincentive to work for anyone earning less than that. That still means fitting up to an extra $10,000 per year for all the people who don’t earn more than $30,000 a year into the budget, which still isn’t easy. Maybe an easy way to start might be to make it so you can only opt-in if you’ve filed a tax return for the past three years and are 21 or over, which would exclude a lot of the people who’d otherwise be getting large payouts. Interactions with newstart, and various pensions would also need a bunch of work. I wish there was a political party that had a policy like that. 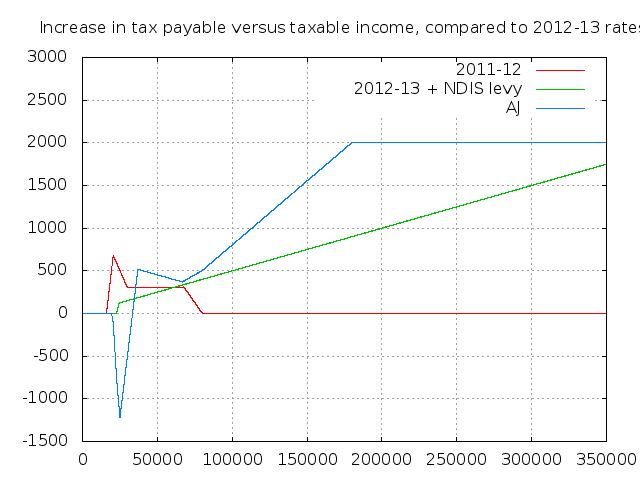 But the ALP and Greens seem to be against fewer brackets on the general principle that anything that’s good for the rich is bad for Australia (and the Greens think a good starting point for a UBI is $18,200 per year, or even better would be $23,000 per year funded by a top tax bracket of 78% which is just absurd), while the LDP wants a flat 20% tax with a $40,000 tax free threshold and fewer transfer payments rather than more, and everyone else tends to want to only give welfare payments to people who prove they need it, rather than a universal scheme, again on principle, despite that making it harder for welfare recipients to work. The Libs come the closest, but their vision still barely gets one and a half of the four income tax recommendations from the Henry report implemented one and a half decades after the report came out. Which is better than nothing, or going in the wrong direction, but it’s hardly very inspiring. Posted on 2018/09/06, 16:24, by aj, under poli-mics. I have a few things I need to write, but am still a bit too sick with the flu to put together something novel, so instead I’m going to counter-blog Rob Collins recent claim that Money doesn’t matter. Rob’s thoughts are similar to ones I’ve had before, but I think they’re ultimately badly mistaken. There’s three related, but very different, ways of thinking about money: as a store of value, as a medium of exchange, and as a unit of account. In normal times, dollars (or pounds or euros) work for all three things, so it’s easy to confuse them, but when you’re comparing different moneys some are better at one than another, and when a money starts failing, it will generally fail at each purpose at different rates. Rob says “Money isn’t wealth” — but that’s wrong. In so far as money serves as a store of value, it is wealth. That’s why having a million dollars in your bank account makes you feel wealthy. The obvious failure mode for store of value is runaway inflation, and that quickly becomes a humanitarian disaster. Money can be one way to store value, but it isn’t the only way: you can store value by investing in artwork, buying property, building a company, or anything else that you expect to be able to sell at some later date. The main difference between those forms of investment versus money is that, ideally, monetary investments have low risk (perhaps the art you bought goes out of fashion and becomes worthless, or the company goes bankrupt, but your million dollars remains a million dollars), and low variance (you won’t make any huge profits, but you won’t make huge losses either). Unlike other assets, money also tends to be very fungible — if you earn $1000, you can spend $100 and have $900 left over; but if you have an artwork worth $1000 it’s a lot harder to sell one tenth of it. Rob follows up by saying that money is “a thing you can exchange for other things”, which is true — money is a medium of exchange. Ideally it’s cheap and efficient, hard to counterfeit, and easy to verify. This is mostly a matter of technology: pretty gems are good at these things in some ways, coins and paper notes are good in others, cheques kind of work though they’re a bit to easy to counterfeit and a bit too hard to verify, and these days computer networks make credit card systems pretty effective. Ultimately a lot of modern systems have ended up as walled gardens though, and while they’re efficient, they aren’t cheap: whether you consider the 1% fees credit card companies charge, or the 2%-4% fees paypal charges, or the 30% fees from the Apple App Store or Google Play Stores, those are all a lot larger than how much you’d lose accepting a $50 note from someone directly. I have a lot of hope that Bitcoin’s Lightning Network will eventually have a huge impact here. Note that if money isn’t wealth — that is, it doesn’t manage to be a good store of value even in the short term, it’s not a good medium of exchange either: you can’t buy things with it because the people selling will have to immediately get rid of it or they’ll be making a loss; which is why currencies undergoing hyperinflation result in black markets where trade happens in stable currencies. With modern technology and electronic derivatives, you could (in theory) probably avoid ever holding money. If you’re a potato farmer and someone wants to buy a potato from you, but you want to receive fertilizer for next season’s crop rather than paper money, the exchange could probably be fully automated by an online exchange so that you end up with an extra hundred grams of fertilizer in your next order, with all the details automatically worked out. If you did have such a system, you’d entirely avoid using money as a store of value (though you’d probably be using a credit account with your fertilizer supplier as a store of value), and you’d at least mostly avoid using money as a medium of exchange, but you’d probably still end up using money as a medium of account — that is you’d still be listing the price of potatoes in dollars. A widely accepted unit of account is pretty important — you need it in order to make contracts work, and it makes comparing different trades much easier. Compare the question “should I sell four apples for three oranges, or two apples for ten strawberries?” with “should I sell four apples for $5, or two apples for $3” and “should I buy three oranges for $5 or ten strawberries for $3?” While I suppose it’s theoretically possible to do finance and economics without a common unit of account, it would be pretty difficult. This is a pretty key part and it’s where money matters a lot. If you have an employment contract saying you’ll be paid $5000 a month, then it’s pretty important what “$5000” is actually worth. If a few months down the track there’s a severe inflation event, and it’s only worth significantly less, then you’ve just had a severe pay cut (eg, the Argentinian Peso dropped from 5c USD in April to 2.5c USD in September). If you’ve got a well managed currency, that usually means low but positive inflation, so you’ll instead get a 2%-5% pay cut every year — which is considered desirable by economists as it provides an automatic way to devote less resources to less valuable jobs, without managers having to deliberately fire people, or directly cut peoples’ pay. Of course, people tend to be as smart as economists, and many workers expect automatic pay rises in line with inflation anyway. Rob’s next bit is basically summarising the concept of sticky prices: if there’s suddenly more money to go around, the economy goes weird because people aren’t able to fix prices to match the new reality quickly, causing shortages if there’s more money before there’s higher prices, or gluts (and probably a recession) if there’s less money and people can’t afford to buy all the stuff that’s around — this is what happened in the global financial crisis in 2008/9, though I don’t think there’s really a consensus on whether the blame for less money going around should be put on the government via the Federal Reserve, or the banks, or some other combination of actors. To summarise so far: money does matter a lot. Having a common unit of account so you can give things meaningful prices is essential, having a convenient store of value that you can use for large and small amounts, and being able to easily trade it for goods and services is a really big deal. Screwing it up hurts people directly, and can be really massively harmful. You could probably use something different for medium of exchange than method of account (eg, a lot of places accepting cryptocurrencies use the cryptocurrency as medium of exchange, but use regular dollars for both store of value and pricing); but without a store of value you don’t have a medium of exchange, and once you’ve got a method of account, having it also work as a store of value is probably too convenient to skip. But all that said, money is just a tool — generally money isn’t what anyone wants, people want the things they can get with money. Rob phrases that as “resources and productivity”, which is fine; I think the economics jargon would be “real GDP” — ie, the actual stuff that goes into GDP, as opposed to the dollar figure you put on it. Things start going wonky quickly though, in particular with the phrase “If, given the people currently in our country, and what they are being paid to do today, we have enough resources, and enough labour-and-productivity to …” — this starts mixing up nominal and real terms: people expect to be paid in dollars, but resources and labour are real units. If you’re talking about allocating real resources rather than dollars, you need to balance that against paying people in real resources rather than dollars as well, because that’s what they’re going to buy with their nominal dollars. Why does that matter? Ultimately, because it’s very easy to get the maths wrong and not have your model of the national economy balanced: you allocate some resources here, pay some money there, then forget that the people you paid will use that money to reallocate some resources. If the error’s large enough and systemic enough, you’ll get runaway inflation and all the problems that go with it. Rob has a specific example here: an unemployed (but skilled) builder, and a homeless family (who need a house built). Why not put the two together, magic up some money to prime the system and build a house? Voila the builder has a job, and the family has a home and everyone is presumably better off. But you can do the same thing without money: give the homeless family a loaded gun and introduce them to the builder: the builder has a job, and the family get a home, and with any luck the bullet doesn’t even get used! The key problem was that we didn’t inspect the magic sufficiently: the builder doesn’t want a job, or even money, he wants the rewards that the job and the money obtain. But where do those rewards come from? Maybe we think the family will contribute to the economy once they have a roof over their heads — if so, we could commit to that: forget the gun, the family goes to a bank, demonstrates they’ll be able to earn an income in future, and takes out a loan, then goes to the builder and pays for their house, and then they get jobs and pay off their mortgage. But if the house doesn’t let the family get jobs and pay for the home, the things the builder buys with his pay have to come from somewhere, and the only way that can happen is by making everyone else in the country a little bit poorer. Do that enough, and everyone who can will move to a different country that doesn’t have that problem. Loans are a serious answer to the problem in general: if the family is going to be able to work and pay for the house eventually, the problem isn’t one of money, it’s one of risk: whoever currently owns the land, or the building supplies, or whatever doesn’t want to take the risk they’ll never see anything for letting the house get built. But once you have someone with founds who is willing to take the risk, things can start happening without any change in government policies. Loaning directly to the family isn’t the only way; you could build a set of units on spec, and run a charity that finds disadvantaged families, and sets them up, and maybe provide them with training or administrative support to help them get into the workforce, at which point they can pay you back and you can either turn a profit, or help the next disadvantaged family; or maybe both. This brings us back to the claim Rob makes at the start of his blog: that the whole “government cannot pay for healthcare” thing is nonsense. It’s not nonsense: at the extreme, government can’t pay for enough healthcare for everyone to live to 120 while feeling like they’re 30. Even paying enough for everyone to have the best possible medical care isn’t feasible: even if NZ has a uniform health care system with 100% of its economy devoted to caring for the sick and disabled, there’s going to be a specialist facility somewhere overseas that does a better job. If there isn’t a uniform healthcare system (and there won’t be, even if only due to some doctors/nurses being individually more talented), there’ll also be better and worse places to go in NZ. The reason we have worrying fiscal crises in healthcare and aged support isn’t just a matter of money that can be changed with inflation, it’s that the real economic resources we’re expecting to have don’t align with the promises we’re already making. Those resources are usually expressed in dollar terms, but that’s because having a unit of account makes talking about these things easier: we don’t have to explicitly say “we’ll need x surgeons and y administrators and z MRI machines and w beds” but instead can just collect it all and say “we’ll need x billion dollars”, and leave out a whole mass of complexity, while still being reasonably accurate. Probably the worst part of Rob’s blog is this though: “We get 10% less things done. Big deal.” Getting 10% less things done is a disaster, for comparison the Great Recession in the US had a GDP drop of less than half that, at -4.2% between 2007Q4 and 2009Q2, and the Great Depression was supposedly about -15% between 1929 and 1932. Also, saying “we’d want 90% of folk not working” is pretty much saying “90% of folk have nothing of value to contribute to anyone else”, because if they did, they could do that, be paid for it, and voila, they’re working. That simply doesn’t seem plausible to me, and I think things would get pretty ugly if it ended up that way despite it’s implausibility. Posted on 2018/05/25, 21:00, by aj, under btc. I figured “Someday we’ll find it: the Bitcoin connection; the coders, exchanges, and me” was too long for a title. Anyhoo, since very late February I’ve been gainfully employed in the cryptocurrency space, as a developer on Bitcoin Core at Xapo (it always sounds pretentious to shorten that to “bitcoin core developer” to me). I mentioned this to Rusty, whose immediate response (after “Congratulations”) was “Xapo is weird”. I asked if he could name a Bitcoin company that’s not weird — turns out that’s still an open research problem. A lot of Bitcoin is my kind of weird: open source, individualism, maths, intense arguments, economics, political philosophies somewhere between techno-libertarianism and anarcho-capatalism (“ancap”, which shouldn’t be confused with the safety rating), and a general “we’re going to make the world a better place with more freedom and cleverer technology” vibe of the thing. Xapo in particular is also my kind of weird. For one, it’s founded by Argentinians who have experience with the downsides of inflation (currently sitting at 20% pa, down from 40% and up from 10%), even if that pales in comparison to Venezuela, the world’s current socialist basket case suffering from hyperinflation; and Xapo’s CEO makes what I think are pretty good points about Bitcoin improving global well-being by removing a lot of discretion from monetary policy — as opposed to doing blockchains to make finance more financey, or helping criminals and terrorists out, or just generally getting rich quick. Relatedly, Xapo (seems to me to be) much more of a global company than many cryptocurrency places, which often seem very Silicon Valley focussed (or perhaps NYC, or wherever their respective HQ is); it might be a bit self-indulgent, but I really like being surrounded by people with oddly different cultures, and at least my general impression of a lot of Silicon Valley style tech companies these days is more along the lines of “dysfunctional monoculture” than anything positive. Xapo’s tech choices also seem to be fairly good, or at least in line with my preferences (python! using bitcoin core! microservices!). Xapo is also one of pretty few companies that’s got a strong Bitcoin focus, rather than trying to support every crazy new cryptocurrency or subtoken out there: I tend to think Bitcoin’s the only cryptocurrency that really has good technical and economic fundamentals; so I like “Bitcoin maximilism” in principle, though I guess I’m hard pressed to argue it’s optimal at the business level. For anyone who follow Bitcoin politics, Xapo might seem a strange choice — Xapo not long ago was on the losing side of the S2X conflict, and why team up with a loser instead of the winners? I don’t take that view for a couple of reasons: I didn’t ever really think doubling the blocksize (the 2X part) was a fundamentally bad idea (not least, because segwit (the S part) already does that and more under some circumstances), but rather the problem was the implementation plan of doing it in just a few months, against the advice of all the most knowledgeable developers, and having an absolutely terrible response when problems with the implementation were found. But although that was probably unavoidable considering the mandate to activate S2X within just a few months, I think the majority of the blame is rightly put on the developers doing the shoddy work, and the solution is for companies to work with developers who can say “no” convincingly, or, preferably, can say “yes, and this is how” long enough in advance that solving the problem well is actually possible. So working with any (or at least most) of the S2X companies just seems like being part of the solution to me. And in any event, I want to live in a world where different viewpoints are welcome and disagreement is okay, and finding out that you’re wrong just means you learned something new, not that you get punished and ostracised. Likewise, you could argue that anyone who wants to really use Bitcoin should own their private keys, rather than use something like Xapo as a wallet or even a vault, and that working on Xapo is kind-of opposed to the “be your own bank” philosophy at the heart of Bitcoin. My belief is that there’s still a use for banks with Bitcoin: safely storing valuables is hard even when they’re protected by maths instead of (or as well as) locks or guns; so it still makes sense for many people to want to outsource the work of maintaining private keys, and unless you’re an IT professional, it’s probably more sensible to do that to a company that looks kind of like a bank (ie, a custodial wallet like Xapo) rather than one that looks like a software vendor (bitcoin core, electrum, etc) or a hardware vendor (ledger or trezor, eg). In that case, the key benefit that Bitcoin offers is protection from government monetary policy, and, hopefully better/cheaper access or storage of your wealth, which isn’t nothing, even if it’s not fully autonomous control over your wealth. For the moment, there’s plenty of things to work on at Xapo: I’ve been delaying writing this until I could answer the obvious “when segwit?” question (“now!”), but there’s still more bits to do there, and obviously there are lots of neat things to do improving the app, and even more non-development things to do like dealing with other financial institutions, compliance concerns, and what not. Mostly that’s stuff I help with, but not my focus: instead, the things I’m lucky enough to get to work on are the ones that will make a difference in months/years to come, rather than the next few weeks, which gives me an excuse to keep up to date with things like lightning and Schnorr signatures and work on open source bitcoin stuff in general. It’s pretty fantastic. The biggest risk as I see it is I end up doing too much work on getting some awesome new feature or project prototyped for Xapo and end up having to maintain it, downgrading this from dream job to just a motherforking fantastic one. I mean, aside from the bigger risks like cryptocurrency turns out to be a fad, or we all die from nuclear annihilation or whatever. I don’t really think disclosure posts are particularly necessary — it’s better to assume everyone has undisclosed interests and biases and judge what they say and do on its own merits. But in the event they are a good idea: financially, I’ve got as yet unvested stock options in Xapo which I plan on exercising and hope will be worth something someday, and some Bitcoin which I’m holding onto and hope will still be worth something some day. I expect those to be highly correlated, so anything good for one will be good for the other. Technically, I think Bitcoin is fascinating, and I’ve put a lot of work into understanding it: I’ve looked through the code, I’ve talked with a bunch of the developers, I’ve looked at a bunch of the crypto, and I’ve even done a graduate diploma in economics over the last couple of years to have some confidence in my ability to judge the economics of it (though to be fair, that wasn’t the reason I had for enrolling initially), and I think it all makes pretty good sense. I can’t say the same about other cryptocurrencies, eg Litecoin’s essentially the same software, but the economics of having a “digital silver” to Bitcoin’s “digital gold” doesn’t seem to make a lot of sense to me, and while Ethereum aims at a bunch of interesting problems and gets the attention it deserves as a result, I’m a long way from convinced it’s got the fundamentals right, and a lot of other cryptocurrency things seem to essentially be scams. Oh, perhaps I should also disclose that I don’t have access to private keys for $10 billion dollars worth of Bitcoin; I’m happily on the open source technology side of things, not on the access to money side. Of course, my opinions on any of that might change, and my financial interests might change to reflect my changed opinions. I don’t expect to update this blog post, and may or may not post about any new opinions I might form. Which is to say that this isn’t financial advice, I’m not a financial advisor, and if I were, I’m certainly not your financial advisor. If you still want financial advice on crypto, I think Wences’s is reasonable: take 1% of what you’re investing, stick it in Bitcoin, and ignore it for a decade. If Bitcoin goes crazy, great, you’ve doubled your money and can brag about getting in before Bitcoin went up two orders of magnitude; if it goes terrible, you’ve lost next to nothing. One interesting note: the press is generally reporting Bitcoin as doing terribly this year, maintaining a value of around $7000-$9000 USD after hitting highs of up to $19000 USD mid December. That’s not fake news, but it’s a pretty short term view: for comparison, Wences’s advice linked just above from less than 12 months ago (when the price was about $2500 USD) says “I have seen a number of friends buy at “expensive” prices (say, $300+ per bitcoin)” — but that level of “expensive” is still 20 or 30 times cheaper than today. As a result, in spite of the “bad” news, I think every cryptocurrency company that’s been around for more than a few months is feeling pretty positive at the moment, and most of them are hiring, including Xapo. So if you want to work with me on Xapo’s backend team we’re looking for Python devs. But like every Bitcoin company, expect it to be a bit weird. I’ve been trying to make heads or tails of what the heck is going on in Bitcoin for a while now. I’m not sure I’ve actually made that much progress, but I’ve at least got some thoughts that seem coherent now. First, this post is background for people playing along at home who aren’t familiar with the issues or jargon: Bitcoin is a currency based on an electronic ledger that essentially tracks how much Bitcoin exists, and how someone can be authorised to transfer it to someone else; that ledger is currently about 100GB in size, growing at a rate of about a gigabyte a week. The ledger is updated by miners, who compete by doing otherwise pointless work running cryptographic hashes (and in so doing obtain a “proof of work”), and in return receive a reward (denominated in bitcoin) made up from fees by people transacting and an inflation subsidy. Different miners are competing in an essentially zero-sum game, because fees and inflation are essentially a fixed amount that is (roughly) divided up amongst miners according to how much work they do — so while you get more reward for doing more work, it comes at a cost of other miners receiving less reward. Because the ledger only grows by (about) a gigabyte each week (or a megabyte per block, which is roughly every ten minutes), there is a limit on how many transactions can be included each week (ie, supply is limited), which both increases fees and limits adoption — so for quite a while now, people in the bitcoin ecosystem with a focus on growth have wanted to work out ways to increase the transaction rate. 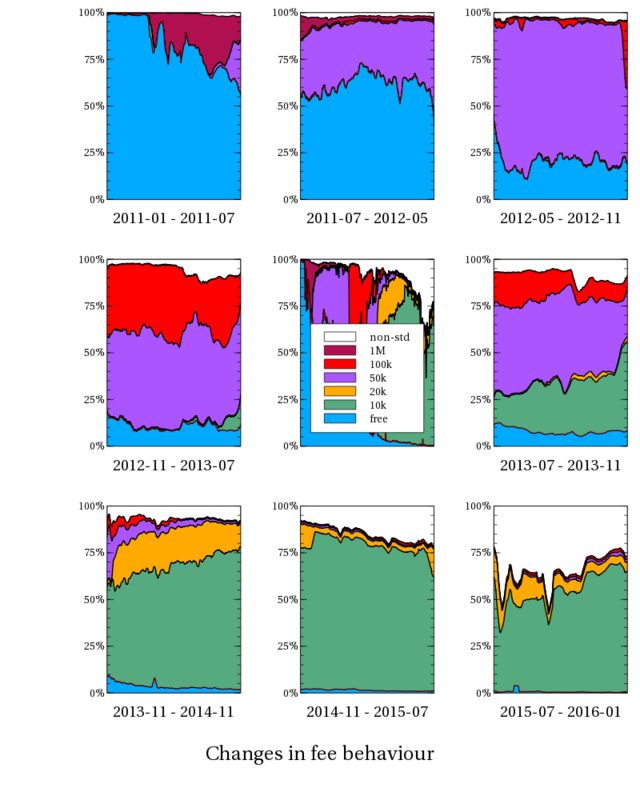 Initial proposals in mid 2015 suggested allowing miners to regularly determine the limit with no official upper bound (nominally “BIP100“, though never actually formally submitted as a proposal), or to increase by a factor of eight within six months, then double every two years after that, until reaching almost 200 times the current size by 2036 (BIP101), or to increase at a rate of about 17% per annum (suggested on the mailing list, but never formally proposed BIP103). These proposals had two major risks: locking in a lot of growth that may turn out to be unnecessary or actively harmful, and requiring what is called a “hard fork”, which would render the existing bitcoin software unable to track the ledger after the change took affect with the possible outcome that two ledgers would coexist and would in turn cause a range of problems. To reduce the former risk, a minimal compromise proposal was made to “kick the can down the road” and just double the ledger growth rate, then figure out a more permanent solution down the road (BIP102) (or to double it three times — to 2MB, 4MB then 8MB — over four years, per Adam Back). A few months later, some of the devs figured out a way to more or less achieve this that also doesn’t require a hard fork, and comes with a host of other benefits, and proposed an update called “segregated witness” at the December 2015 Scaling Bitcoin conference. Most recently, and presumably on the basis that the opposed group are mostly worried that deploying segregated witness will prevent or significantly delay a more direct increase in capacity, a bitcoin venture capitalist, Barry Silbert, organised an agreement amongst a number of companies including many miners, to both activate segregated witness within the next month, and to do a hard fork capacity increase by the end of the year. This is the “segwit2x” project; named because it takes segregated witness, (“segwit”) and then additionally doubles its capacity increase (“2x”). This agreement is not supported by any of the existing dev team, and is being developed by Jeff Garzik (who was behind BIP100 and BIP102 mentioned above) in a forked codebase renamed “btc1“, so if successful, this may also satisfy members of the opposed group motivated by a desire to take control of the bitcoin codebase and roadmap, despite that not being an explicit part of the agreement itself. To me, the arguments presented for opposing segwit don’t really seem plausible. As far as future development goes, a roadmap was put out in December 2015 and endorsed by many developers that explicitly included a hard fork for increased capacity (“moderate block size increase proposals (such as 2/4/8 …)”), among many other things, so the risk of no further progress happening seems contrary to the facts to me. The core bitcoin devs are extremely capable in my estimation, so replacing them seems a bad idea from the start, but even more than that, they take a notably hands off approach to dictating where Bitcoin will go in future — so, to my mind, it seems like a more sensible thing to try would be working with them to advance the bitcoin ecosystem in whatever direction you want, rather than to try to replace them outright. In that context, it seems particularly notable to me that in the eighteen months between the segregated witness proposal and the segwit2x agreement, there hasn’t been any serious attempt to propose a hard fork capacity increase that meets the core dev’s quality standards; for instance there has never been any code for BIP100, and of the various hard forking codebases that have arisen by advocates of the hard fork approach — Bitcoin XT, Bitcoin Classic, Bitcoin Unlimited, btc1, and Bitcoin ABC — none have been developed in a way that’s suitable for the changes to be reviewed and merged into core via a pull request in the normal fashion. Further, since one of the main criticisms of a hard fork is that deployment costs are higher when it is done in a short time frame (weeks or a few months versus a year or longer), that lack of engagement over the past 18 months followed by a desperate rush now seems particularly poor to me. A different explanation for the opposition to segwit became public in April, however. ASICBoost is a patent-pending optimisation to the way Bitcoin miners do the work that entitles them to extend the ledger (for which they receive the rewards described earlier), and while there are a few ways of making use of ASICBoost, perhaps the most effective way turns out to be incompatible with segwit. There are three main alternatives to the covert, segwit-incompatible approach, all of which have serious downsides. The first, overt ASICBoost via modifying the block version reveals that you’re using ASICBoost, which would either (a) encourage other miners to also use the optimisation reducing your profits, (b) give the patent holder cause to charge you royalties or cause other problems (assuming the patent is eventually granted and deemed valid), or (c) encourage the bitcoin community at large to change the ecosystem rules so that the optimisation no longer works. The second, mining empty blocks via ASICBoost means you don’t gain any fee income, reducing your revenue and hence profit. And the third, rolling the extranonce to find a collision rather than combining partial transaction trees increases the preparation work by a factor of ten or so, which is probably enough to outweigh the savings from the optimisation in the first place. If ASICBoost were being used by a significant number of miners, and segregated witness prevents its continued use in practice, then we suddenly have a very plausible explanation for much of the apparent madness: the loss of the optimisation could significantly increase some miners’ costs or reduce their revenue, reducing profit either way (a high end estimate of $100,000,000 per year was given in the original explanation), which would justify significant investment in blocking that change. Further, an honest explanation of the problem would not be feasible, because this would be just as bad as doing the optimisation overtly — it would increase competition, alert the potential patent owners, and might cause the optimisation to be deliberately disabled — all of which would also negatively affect profits. As a result, there would be substantial opposition to segwit, but the reasons presented in public for this opposition would be false, and it would not be surprising if the people presenting these reasons only give half-hearted effort into providing evidence — their purpose is simply to prevent or at least delay segwit, rather than to actually inform or build a new consensus. To this line of thinking the emphasis on lack of communication from core devs or the desire for a hard fork block size increase aren’t the actual goal, so the lack of effort being put into resolving them over the past 18 months from the people complaining about them is no longer surprising. Is it plausible that preventing ASICBoost would actually cost people millions in profit, or is that just an intriguing hypothetical that doesn’t turn out to have much to do with reality? If preserving ASICBoost is a plausible motivation, what will happen with segwit2x, given that by enabling segregated witness, it does nothing to preserve ASICBoost? Continuing from my previous post on historical Bitcoin fees… Obviously history is fun and all, but it’s safe to say that working out what’s going on now is usually far more interesting and useful. But what’s going on now is… complicated. First, as was established in the previous post, most transactions are still paying 0.1 mBTC in fees (or 0.1 mBTC per kilobyte, rounded up to the next kilobyte). Again, as established in the previous post, that’s a fairly naive approach: miners will fill blocks with the smallest transactions that pay the highest fees, so if you pay 0.1 mBTC for a small transaction, that will go in quickly, but if you pay 0.1 mBTC for a large transaction, it might not be included in the blockchain at all. It’s essentially like going to a petrol station and trying to pay a flat $30 to fill up, rather than per litre (or per gallon); if you’re riding a scooter, you’re probably over paying; if you’re driving an SUV, nobody will want anything to do with you. Pay per litre, however, and you’ll happily get your tank filled, no matter what gets you around. But back in the bitcoin world, while miners have been using the per-byte approach since around July 2012, as far as I can tell, users haven’t really even had the option of calculating fees in the same way prior to early 2015, with the release of Bitcoin Core 0.10.0. Further, that release didn’t just change the default fees to be per-byte rather than (essentially) per-transaction; it also dynamically adjusted the per-byte rate based on market conditions — providing an estimate of what fee is likely to be necessary to get a confirmation within a few blocks (under an hour), or within ten or twenty blocks (two to four hours). You can see from this graph that the estimated fee rates vary over time, both in the peak fee to get a transaction confirmed as quickly as possible, and in how much cheaper it might be if you’re willing to wait. Of course, that just indicates what you “should” be paying, not what people actually are paying. But since the blockchain is a public ledger, it’s at least possible to sift through the historical record. Rusty already did this, of course, but I think there’s a bit more to discover. There’s three ways in which I’m doing things differently to Rusty’s approach: (a) I’m using quantiles instead of an average, (b) I’m separating out transactions that pay a flat 0.1 mBTC, (c) I’m analysing a few different transaction sizes separately. Looking at just the average values doesn’t seem really enlightening to me, because it can be massively distorted by a few large values. 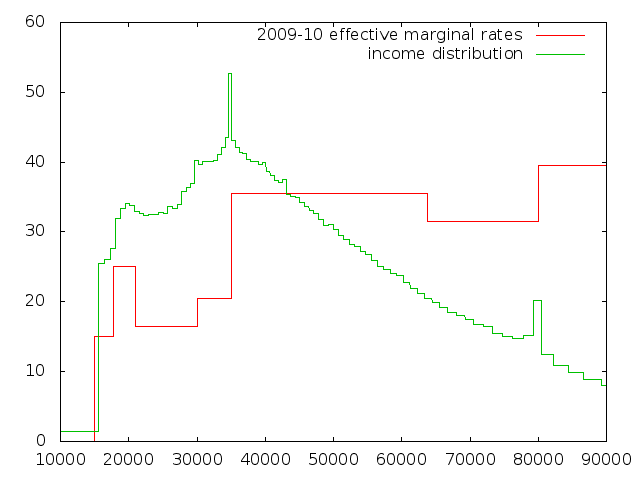 Instead, I think looking at the median value, or even better a few percentiles is likely to work better. In particular I’ve chosen to work with “sextiles”, ie the five midpoints you get when splitting each day’s transactions into sixths, which gives me the median (50%), the tertiles (33% and 66%), and two additional points showing me slightly more extreme values (16.7% and 83.3%). Transactions whose fees don’t reflect market conditions at all, aren’t really interesting to analyse — if there are enough 0.1 mBTC, 200-byte transactions to fill a block, then a revenue maximising miner won’t mine any 400-byte transactions that only pay 0.1 mBTC, because they could fit two 200-byte transactions in the same space and get 0.2 mBTC; and similarly for transactions of any size larger than 200-bytes. There’s really nothing more to it than that. Further, because there are a lot of transactions that are essentially paying a flat 0.1 mBTC fee, they make it fairly hard to see what the remaining transactions are doing — but at least it’s easy to separate them out. Because the 0.10 release essentially made two changes at once (namely, switching from a hardcoded default fee to a fee that varies on market conditions, and calculating the fee based on a per-byte rate rather than essentially a per-transaction rate) it can be hard to see which of these effects are taking place. By examining the effect on transactions of a particular size, we can distinguish the effects however: using a per-transaction fee will result in different transactions sizes paying different per-byte rates, while using per-byte fee will result in the transactions of different sizes harmonising at a particular rate. Similarly, using fee estimation will result in the fees for a particular transaction size varying over time; whereas the average fee rate might vary over time simply due to using per-transaction fees while the average size of transactions varies. I’ve chosen four sizes: 220-230 bytes which is the size of a transaction spending a single, standard, pay-to-public-key-hash (P2PKH) input (with a compressed public key) to two P2PKH outputs; 370-380 bytes which matches a transaction spending two P2PKH inputs to two P2PKH outputs; 520-520 bytes which matches a transaction spending three P2PKH inputs to two P2PKH inputs, and 870-1130 bytes which catches transactions around 1kB. 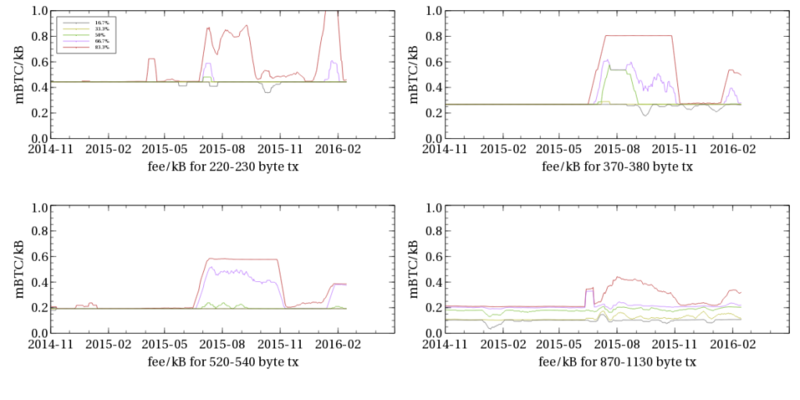 The following set of graphs take this approach, with each transaction size presented as a separate graph. 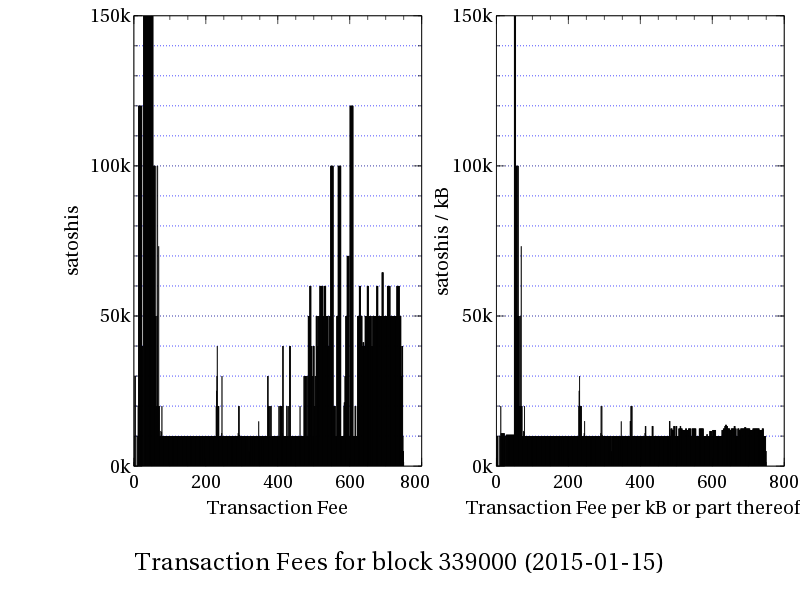 Each graph breaks the relevant transactions into sixths, selecting the sextiles separating each sixth — each sextile is then smoothed over a 2 week period to make it a bit easier to see. We can see that prior to June 2015, fees were fairly reliably set at 0.1 mBTC per kilobyte or part thereof — so 220B transactions paid 0.45 mBTC/kB, 370B transactions paid 0.27 mBTC/kB, 520B transactions paid 0.19 mBTC/kB, and transactions slightly under 1kB paid 0.1 mBTC/kB while transactions slightly over 1kB paid 0.2 mBTC/kB (the 50% median line in between 0.1 mBTC/kB and 0.2 mBTC/kB is likely an artifact of the smoothing). These fees didn’t take transaction size into account, and did not vary depending on market conditions — so they did not reflect changes in demand, how full blocks were, the price of Bitcoin in USD, the hashpower used to secure the blockchain, or any similar factors that might be relevant. We can very clearly see that there was a dramatic response to market conditions in late June 2015 — and not coincidentally this was when the “stress tests” or “flood attack” occurred. It’s also pretty apparent the market response here wasn’t actually very rational or consistent — eg 220B transactions spiked to paying over 0.8 mBTC/kB, while 1000B transactions only spiked to a little over 0.4 mBTC/kB — barely as much as 220B transactions were paying prior to the stress attack. Furthermore, even while some transactions were paying significantly higher fees, transactions paying standard fees were still going through largely unhindered, making it questionable whether paying higher fees actually achieved anything. However, looking more closely at the transactions with a size of around 1000 bytes, we can also see there was a brief period in early July (possibly a very brief period that’s been smeared out due to averaging) where all of the sextiles were above the 0.1 mBTC/kB line — indicating that there were some standard fee paying transactions that were being hindered. That is to say that it’s very likely that during that period, any wallet that (a) wasn’t programmed to calculate fees dynamically, and (b) was used to build a transaction about 1kB in size, would have produced a transaction that would not actually get included in the blockchain. While it doesn’t meet the definition laid out by Jeff Garzik, I think it’s fair to call this a “fee event”, in that it’s an event, precipitated by fee rates, that likely caused detectable failure of bitcoin software to work as intended. On the other hand, it is interesting to notice that a similar event has not yet reoccurred since; even during later stress attacks, or Black Friday or Christmas shopping rushes. First, they’re very messy! That is, even amongst the transactions that pay variable fees, there’s no obvious consensus on what the right fee to pay is, and some users are paying substantially more than others. In early February, which matches the release of Bitcoin Core 0.10.0, there was a dramatic decline in the lowest fees paid — which is what you would predict if a moderate number of users started calculating fees rather than using the defaults, and found that paying very low fees still resulted in reasonable confirmation times. That is to say, wallets that dynamically calculate fees have substantially cheaper transactions. However, those fees did not stay low, but have instead risen over time — roughly linearly. The blue dotted trend line is provided as a rough guide; it rises from 0 mBTC/kB on 1st March 2015, to 0.27 mBTC/kB on 1st March 2016. That is, market driven fees have roughly risen to the same cost per-byte as a 2-input, 2-output transaction, paying a flat 0.1 mBTC. At this point, it’s probably a good idea to check that we’re not looking at just a handful of transactions when we remove those paying standard 0.1 mBTC fees. Graphing the number of transactions per day of each type (ie, total transactions, 220 byte transactions (1-input, 2-output), 370 byte transactions (2-input, 2-output), 520 byte transactions (3-input, 2-output), and 1kB transactions shows that they all increased over the course of the year, and that there are far more small transactions than large ones. 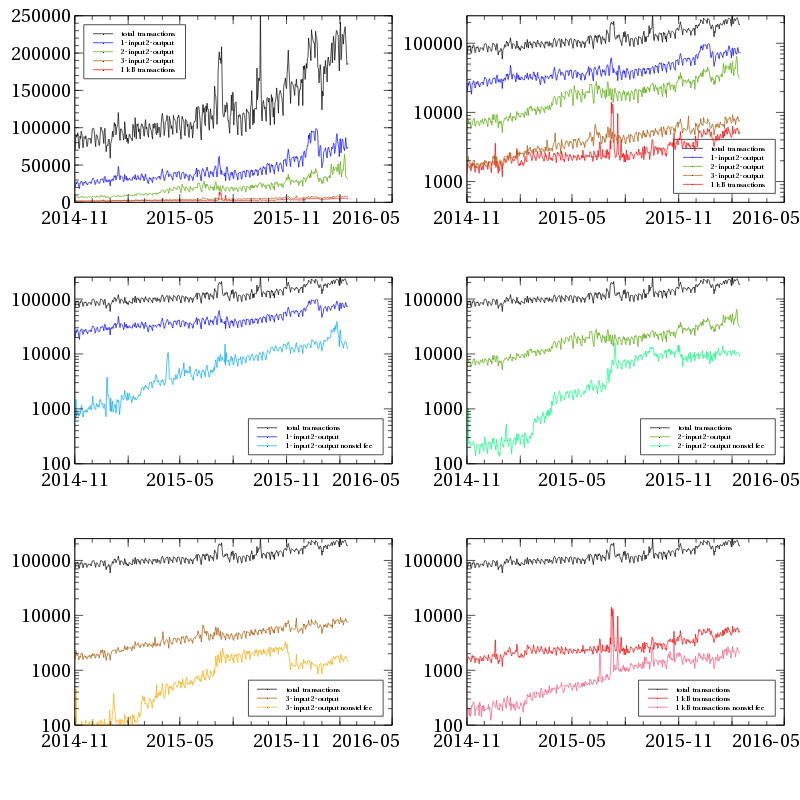 Note that the top-left graph has a linear y-axis; while the other graphs use a logarithmic y-axis — so that each step in the vertical indicates a ten-times increase in number of transactions per day. No smoothing/averaging has been applied. We can see from this that by and large the number of transactions of each type have been increasing, and that the proportion of transactions paying something other than the standard fees has been increasing. 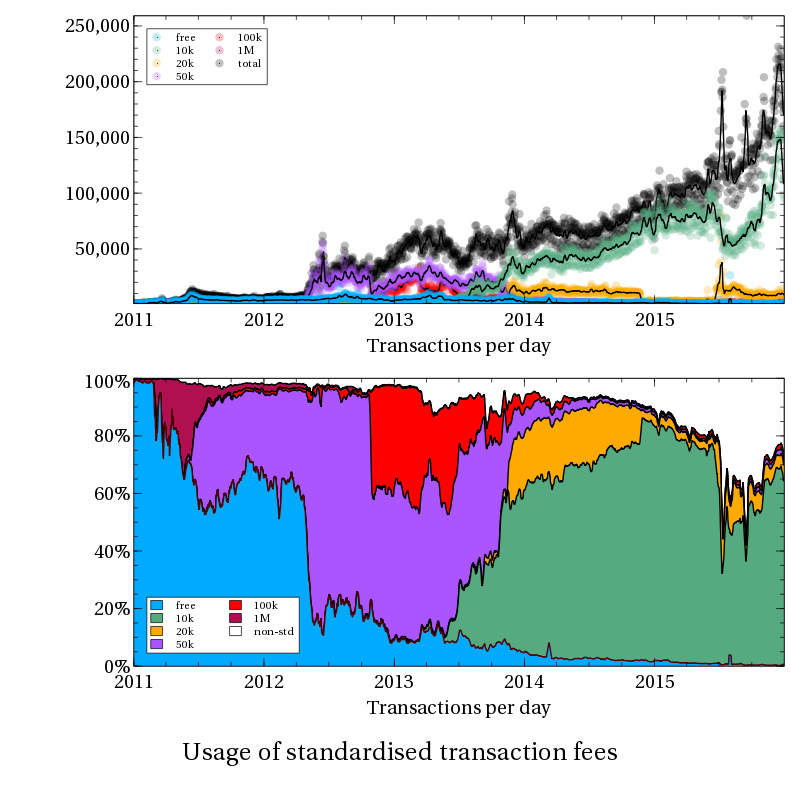 However it’s also worth noting that the proportion of 3-input transactions using non-standard fees actually decreased in November — which likely indicates that many users (or the maintainers of wallet software used by many users) had simply increased the default fee temporarily while concerned about the stress test, and reverted to defaults when the concern subsided, rather than using a wallet that estimates fees dynamically. In any event, by November 2015, we have at least about a thousand transactions per day at each size, even after excluding standard fees. 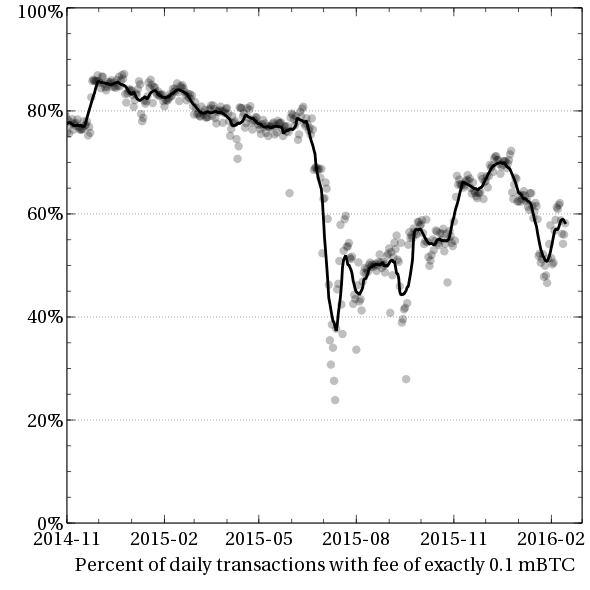 After November 2015, a large bunch of transactions of difference sizes were calculating fees on a per-byte basis, and tracking a common fee-per-byte level, which has both increased and decreased since then. That is to say, a significant number of transactions are using market-based fees! The current market rate is slightly lower than the what a 0.1 mBTC, 2-input, 2-output transaction is paying (ie, 0.27 mBTC/kB). The recent observed markets rate correspond roughly to the 12-minute or 20-minute fee rates in the bitcoinfees graph provided earlier. That is, paying higher rates than the observed market rates is unlikely to result in quicker confirmation. There are many transactions paying significantly higher rates (eg, 1-input 2-output transactions paying a flat 0.1 mBTC). There are also many transactions paying lower rates (eg, 3-input 2-output transactions paying a flat 0.1 mBTC) that can expect delayed confirmation. Along with the trend line, I’ve added four grey, horizontal guide lines on those graphs; one at each of the standard fee rates for the transaction sizes we’re considering (0.1 mBTC/kB for 1000 byte transactions, 0.19 mBTC/kB for 520 byte transactions, 0.27 mBTC/kB for 370 byte transactions, and 0.45 mBTC/kB for 220 byte transactions). An interesting fact to observe is that when the market rate goes above any of the grey dashed lines, then transactions of the corresponding size that just pay the standard 0.1 mBTC fee become now less profitable to mine than transactions that pay the fees at the market rate. In a very particular sense this will induce a “fee event”, of the type mentioned earlier. That is, with the fee rate above 0.1 mBTC/kB, transactions of around 1000 bytes that pay 0.1 mBTC will generally suffer delays. Following the graph, for the transactions we’re looking at there have already been two such events — a fee event in July 2015, where 1000 byte transactions paying standard fees began getting delayed regularly due to the market fees began exceeding 0.1 mBTC/kB (ie, the 0.1 mBTC fee divided by 1 kB transaction size); and following that a second fee event during November impacting 3-input, 2-output transactions, due to market fees exceeding 0.19 mBTC/kB (ie, 0.1 mBTC divided by 0.52 kB). Per the graph, a few of the trend lines are lingering around 0.27 mBTC/kB, indicating a third fee event is approaching, where 370 byte transactions (ie 2-input, 2-output) paying standard fees will start to suffer delayed confirmations. However the grey lines can also be considered as providing “resistance” to fee increases — for the market rate to go above 0.27 mBTC/kB, there must be more transactions attempting to pay the market rate than there were 2-input, 2-output transactions paying 0.1 mBTC. And there were a lot of those — tens of thousands — which means market fees will only be able to increase with higher adoption of software that calculates fees using dynamic estimates. Bitcoin Core 0.11.0 came out in July with some minor fee estimation improvements. Electrum came out with dynamic fees in 2.4.1 in August. Copay (by bitpay) adder dynamic fees in 1.1.3 in August. 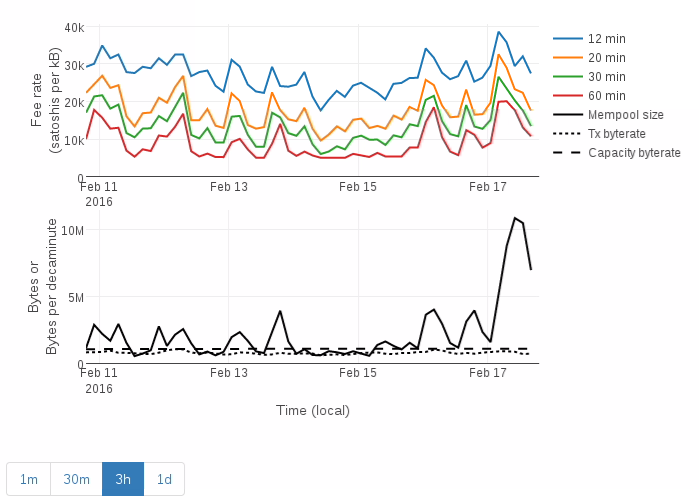 Mycelium added per-byte fees in 2.5.8 in December. Many wallets still don’t calculate fees dynamically, or even calculate fees at a per-byte level. Market-driven fees will only be able to rise further with increased adoption of wallets that support market-driven fees. There have been two fee events for wallets that don’t do market based fees, and paid a flat fee of 0.1 mBTC already. For those wallets, since about July 2015, fees have been high enough to cause transactions near 1000 bytes to have delayed confirmations; and since about November 2015, fees have been high enough to cause transactions above 520 bytes (ie, 3-input, 2-output) to be delayed. A third fee event is very close, affecting transactions above 370 bytes (ie, 2-input, 2-output). Prior to Christmas, Rusty did an interesting post on bitcoin fees which I thought warranted more investigation. My first go involved some python parsing of bitcoin-cli results; which was slow, and as it turned out inaccurate — bitcoin-cli returns figures denominated in bitcoin with 8 digits after the decimal point, and python happily rounds that off, making me think a bunch of transactions that paid 0.0001 BTC in fees were paying 0.00009999 BTC in fees. Embarrassing. Anyway, switching to bitcoin-iterate and working in satoshis instead of bitcoin just as Rusty did was a massive improvement. From a miner’s perspective (ie, the people who run the computers that make bitcoin secure), fees are largely irrelevant — they’re receiving around $11000 USD every ten minutes in inflation subsidy, versus around $80 USD in fees. If that dropped to zero, it really wouldn’t make a difference. However, in around six months the inflation subsidy will halve to 12.5 BTC; which, if the value of bitcoin doesn’t rise enough to compensate, may mean miners will start looking to turn fee income into real money — earning $5500 in subsidy plus $800 from fees could be a plausible scenario, eg (though even that doesn’t seem likely any time soon). 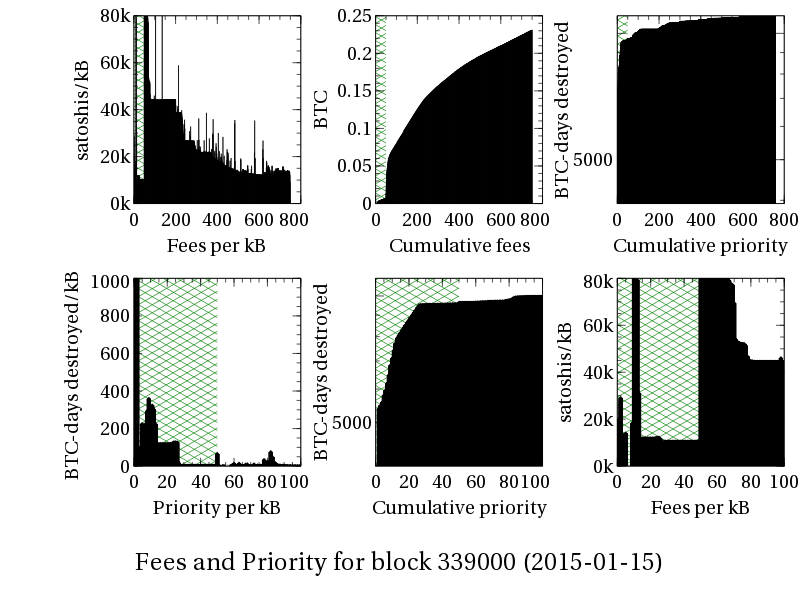 You can see a clear overarching trend where the fee rate starts off high and gradually decreases, with two exceptions: first, the first 50kB (shaded in green) has much lower fees due to mining by priority; and second, there are frequent short spikes of high fees, which are likely produced by high fee transactions that spend the coins mined in the preceeding transaction — ie, if they had been put any earlier in the block, they would have been invalid. Equally, compared to the priority of the first 50kB of transactions, the the remaining almost 700kB contributes very little in terms of priority. From the left hand graph you can see that, a year ago, wallet software was mostly paying about 10000 satoshi in fees, with a significant minority paying 50000 satoshi in fees — but since those were at the end of the block, which was ordered by satoshis per byte, those transactions were much bigger, so that their fee/kB was lower. This seems to be due to some shady maths: while the straightforward way of doing things would be to have a per-byte fee and multiply that by the transaction’s size in bytes, eg 10 satoshis/byte * 233 bytes gives 2330 satoshi fee; things are done in kilobytes instead, and a rounding mistake occurs, so rather than calculating 10000 satoshis/kilobyte * 0.233 kilobytes, the 0.233 is rounded up to 1kB first, and the result is just 10000 satoshi. The second graph reverses the maths to work out what the fee/kilobyte (or part thereof) figure would have been if this formula was used, and for this particular block, pretty much all the transactions look how you’d expect if exactly that formula was used. As a reality check, 1 BTC was trading at about $210 USD at that time, so 10000 satoshi was worth about 2.1c at the time; the most expensive transaction in that block, which goes off the scale I’ve used, spent 240000 satoshi in fees, which cost about 50c. The first graph is essentially the raw data — how many of each sort of fee made it through per day; but it’s not very helpful because bitcoin’s grown substantially. 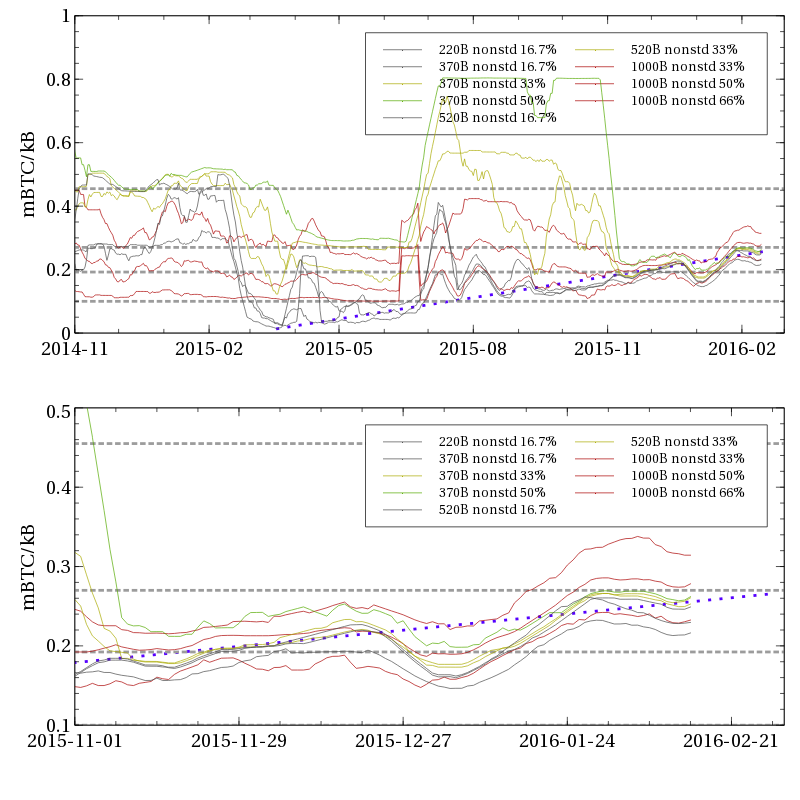 Hence the second graph, which just uses the smoothed data and provides the values in percentage terms stacked one on top of the other. That way the coloured area lets you do a rough visual comparison of the proportion of transactions at each “standard” fee level. in the first phase, up until about July 2011, fees were just getting introduced and most people paid nothing; fees began at 1,000,000 satoshi (0.01 BTC) (v 0.3.21) before setting on a fee level of 50000 satoshi per transaction (0.3.23). in the third phase, up until about November 2012, close to 80% of transactions paid 50000 satoshi per transaction, with free transactions falling to about 20%. in the sixth phase, the year up to November 2014, transactions paying fees of 50k and 100k and free transactions pretty much disappeared, leaving 75% of transactions paying 10k satoshi, and maybe 15% or 20% of transactions paying double that at 20k satoshi. in the eighth phase, up until now, things go a bit haywire. What I think happened is the “stress tests” in July and September caused the number of transactions with variable fees to spike substantially, which caused some delays and a lot of panic, and that in turn caused people to switch from 10k to higher fees (including 20k), as well as adopt variable fee estimation policies. However over time, it looks like the proportion of 10k transactions has crept back up, presumably as people remove the higher fees they’d set by hand during the stress tests. Okay, apparently that was part one. The next part will take a closer look at the behaviour of transactions paying non-standard fees over the past year, in particular to see if there’s any responsiveness to market conditions — ie prices rising when there’s contention, or dropping when there’s not. I’ve been intrigued by micropayments for, like, ever, so I’ve been following Rusty’s experiments with bitcoin with interest. Bitcoin itself, of course, has a roughly 10 minute delay, and a fee of effectively about 3c per transaction (or $3.50 if you count inflation/mining rewards) so isn’t really suitable for true microtransactions; but pettycoin was going to be faster and cheaper until it got torpedoed by sidechains, and more recently the lightning network offers the prospect of small payments that are effectively instant, and have fees that scale linearly with the amount (so if a $10 transaction costs 3c like in bitcoin, a 10c transaction will only cost 0.03c). A bit over a year ago I critiqued sky-high predictions of bitcoin valuations on the basis that “I think you’d start hitting practical limitations trying to put 75% of the world’s transactions through a single ledger (ie hitting bandwidth, storage and processing constraints)” — which is currently playing out as “OMG the block size is too small” debates. But the cool thing about lightning is that it lets you avoid that problem entirely; hundreds, thousands or millions of transactions over weeks or years can be summarised in just a handful of transactions on the blockchain. Of course, this doesn’t work very well if you’re only spending money: it doesn’t take long for all the bitcoins on your lightning channels to end up on the other side, and at that point you can’t spend any more. If you only receive money over lightning, the reverse happens, and you’re still stuck just as quickly. It’s still marginally better than raw bitcoin, in that you have two bitcoin transactions to open and close a channel worth, say, $200, rather than forty bitcoin transactions, one for each $5 you spend on coffee. But that’s only a fairly minor improvement. You could handwave that away by saying “oh, but once lightning takes off, you’ll get your salary paid in lightning anyway, and you’ll pay your rent in lightning, and it’ll all be circular, just money flowing around, lubricating the economy”. But I think that’s unrealistic in two ways: first, it won’t be that way to start with, and if things don’t work when lightning is only useful for a few things, it will never take off; and second, money doesn’t flow around the economy completely fluidly, it accumulates in some places (capitalism! profits!) and drains away from others. So it seems useful to have some way of making degenerate scenarios actually work — like someone who only uses lightning to spend money, or someone who receives money by lightning but only wants to spend cold hard cash. One way you can do that is if you imagine there’s someone on the lightning network who’ll act as an exchange — who’ll send you some bitcoin over lightning if you send them some cash from your bank account, or who’ll deposit some cash in your bank account when you send them bitcoins over lightning. That seems like a pretty simple and realistic scenario to me, and it makes a pretty big improvement. It starts off with Alice and Xavier putting $200 in channels in the network; Bob, Carol and Dave putting in $600 each, and Emma just waiting for cash to arrive. The statistics box in the top right tracks how much each player has on the lightning network (“ln”), how much profit they’ve made (“pf”), and how many coffees Alice has ordered from Emma. About 3000 coffees later, it ends up with Alice having spent about $15,750 in real money on coffee ($5.05/coffee), Emma having about $15,350 in her bank account from making Alice’s coffees ($4.92/coffee), and Bob, Carol and Dave having collectively made about $400 profit on their $1800 investment (about 22%, or the $0.13/coffee difference between what Alice paid and Emma received). At that point, though, Bob, Carol and Dave have pretty much all the funds in the lightning network, and since they only forward transactions but never initiate them, the simulation grinds to a halt. You could imagine a few ways of keeping the simulation going: Xavier could refresh his channels with another $200 via a blockchain transaction, for instance. Or Bob, Carol and Dave could buy coffees from Emma with their profits. Or Bob, Carol and Dave could cash some of their profits out via Xavier. Or maybe they buy some furniture from Alice. Basically, whatever happens, you end up relying on “other economic activity” happening either within lightning itself, or in bitcoin, or in regular cash. But grinding to a halt after earning 22% and spending/receiving $15k isn’t actually too bad even as it is. So as a first pass, it seems like a pretty promising indicator that lightning might be feasible economically, as well as technically. One somewhat interesting effect is that the profits don’t get distributed particularly evenly — Bob, Carol and Dave each invest $600 initially, but make $155.50 (25.9%), $184.70 (30.7%) and $52.20 (8.7%) respectively. I think that’s mostly a result of how I chose to route payments — it optimises the route to choose channels with the most funds in order to avoid payments getting stuck, and Dave just ends up handling less transaction volume. Having a better routing algorithm (that optimises based on minimum fees, and relies on channel fees increasing when they become unbalanced) might improve things here. Or it might not, and maybe Dave needs to quote lower fees in general or establish a channel with Xavier in order to bring his profits up to match Bob and Carol. Posted on 2014/03/22, 18:47, by aj, under redhat. That’s not to say the python was is bad or anything — it’s certainly easier than trying to do it in shell, or with urllib2 or whatever. But I like using python because it makes the difference between pseudocode and real code small, and in this case, the xmlrpc approach is much closer to the pseudocode I’d write than the requests code. So I had a look around to see if there were any nice libraries to make REST API access easy from the client side. Ended up getting kind of distracted by reading through various arguments that the sorts of things generally called REST APIs aren’t actually “REST” at all according to the original definition of the term, which was to describe the architecture of the web as a whole. One article that gives a reasonably brief overview is this take on REST maturity levels. Otherwise doing a search for the ridiculous acronym “HATEOAS” probably works. I did some stream-of-consciousness posts on Google-Plus as well, see here, here and here. As per the README in the source, you can throw in a session object to do various sorts of authentication, including Kerberos and OAuth 1.0a. I’ve tried it with github, twitter, and xero’s public APIs with decent success. It also seems to work with Magento and some of Red Hat’s internal tools without any hassle. Two posts in one month! Woah! A couple of weeks ago there was a flurry of stuff about the Liberal party’s Parental Leave policy (viz: 26 weeks at 100% of your wage, paid out of the general tax pool rather than by your employer, up to $150k), mostly due to a coalition backbencher coming out against it in the press (I’m sorry, I mean, due to “an internal revolt”, against a policy “detested by many in the Coalition”). Anyway, I haven’t had much cause to give it any thought beforehand — it’s been a policy since the 2010 election I think; but it seems like it might have some interesting consequences, beyond just being more money to a particular interest group. In particular, one of the things that doesn’t seem to me to get enough play in the whole “women are underpaid” part of the ongoing feminist, women-in-the-workforce revolution, is how much both the physical demands of pregnancy and being a primary caregiver justifiably diminish the contributions someone can make in a career. That shouldn’t count just the direct factors (being physically unable to work for a few weeks around birth, and taking a year or five off from working to take care of one or more toddlers, eg), but the less direct ones like being less able to commit to being available for multi-year projects or similar. There’s also probably some impact from the cross-over between training for your career and the best years to get pregnant — if you’re not going to get pregnant, you just finish school, start working, get more experience, and get paid more in accordance with your skills and experience (in theory, etc). If you are going to get pregnant, you finish school, start working, get some experience, drop out of the workforce, watch your skills/experience become out of date, then have to work out how to start again, at a correspondingly lower wage — or just choose a relatively low skill industry in the first place, and accept the lower pay that goes along with that. I don’t think either the baby bonus or the current Australian parental leave scheme has any affect on that, but I wonder if the Liberal’s Parental Leave scheme might. There’s three directions in which it might make a difference, I think. One is for women going back to work. Currently, unless your employer is more generous, you have a baby, take 16 weeks of maternity leave, and get given the minimum wage by the government. If that turns out to work for you, it’s a relatively easy decision to decide to continue being a stay at home mum, and drop out of the workforce for a while: all you lose is the minimum wage, so it’s not a much further step down. On the other hand, after spending half a year at your full wage, taking care of your new child full-time, it seems a much easier decision to go back to work than to be a full-time mum; otherwise you’ll have to deal with a potentially much lower family income at a time when you really could choose to go back to work. Of course, it might work out that daycare is too expensive, or that the cut in income is worth the benefits of a stay at home mum, but I’d expect to see a notable pickup in new mothers returning to the workforce around six months after giving birth anyway. That in turn ought to keep women’s skills more current, and correspondingly lift wages. Another is for employers dealing with hiring women who might end up having kids. Dealing with the prospect of a likely six-month unpaid sabbatical seems a lot easier than dealing with a valued employee quitting the workforce entirely on its own, but it seems to me like having, essentially, nationally guaranteed salary insurance in the event of pregnancy would make it workable for the employee to simply quit, and just look for a new job in six month’s time. And dealing with the prospect of an employee quitting seems like something employers should expect to have to deal with whoever they hire anyway. Women in their 20s and 30s would still have the disadvantage that they’d be more likely to “quit” or “take a sabbatical” than men of the same age and skillset, but I’m not actually sure it would be much more likely in that age bracket. So I think there’s a good chance there’d be a notable improvement here too, perhaps even to the point of practical equality. Finally, and possibly most interestingly, there’s the impact on women’s expectations themselves. One is that if you expect to be a mum “real soon now”, you might not be pushing too hard on your career, on the basis that you’re about to give it up (even if only temporarily) anyway. So, not worrying about pushing for pay rises, not looking for a better job, etc. It might turn out to be a mistake, if you end up not finding the right guy, or not being able to get pregnant, or something else, but it’s not a bad decision if you meet your expectations: all that effort on your career for just a few weeks pay off and then you’re on minimum wage and staying home all day. But with a payment based on your salary, the effort put into your career at least gives you six month’s worth of return during motherhood, so it becomes at least a plausible investment whether or not you actually become a mum “real soon now” or not. According to the 2010 tax return stats I used for my previous post, the gender gap is pretty significant: there’s almost 20% less women working (4 million versus 5 million), and the average working woman’s income is more than 25% less than the average working man’s ($52,600 versus $71,500). I’m sure there are better ways to do the statistics, etc, but just on those figures, if the female portion of the workforce was as skilled and valued as the male portion, you’d get a $77 billion dollar increase in GDP — if you take 34% as the proportion of that that the government takes, it would be a $26 billion improvement to the budget bottom line. That, of course, assumes that women would end up no more or less likely to work part time jobs than men currently are; that seems unlikely to me — I suspect the best that you’d get is that fathers would become more likely to work part-time and mothers less likely, until they hit about the same level. But that would result in a lower increase in GDP. Based on the above arguments, there would be increase the number of women in the workforce as well, though that would get into confusing tradeoffs pretty quickly — how many families would decide that a working mum and stay at home dad made more sense than a stay at home mum and working dad, or a two income family; how many jobs would be daycare jobs (counted as GDP) in place of formerly stay at home mums (not counted as GDP, despite providing similar value, but not taxed either), etc. I’m somewhat surprised I haven’t seen any support for the coalition’s plans along these lines anywhere. Not entirely surprised, because it’s the sort of argument that you’d make from the left — either as a feminist, anti-traditional-values, anti-stay-at-home-mum plot for a new progressive genderblind society; or from a pure technocratic economic point-of-view; and I don’t think I’ve yet seen anyone with lefty views say anything that might be construed as being supportive of Tony Abbott… But I would’ve thought someone on the right Bolt or Albrechtsen or Australia’s leading libertarian and centre-right blog or the Liberal party’s policy paper might have canvassed some of the other possible pros to the idea rather than just worrying about the benefits to the recipients, and how it gets paid for. In particular, the argument for any sort of payment like this shouldn’t be about whether it’s needed/wanted by the recipient, but how it benefits the rest of society. Anyway.